Supplement Date: Jun 2018 i Previous editions(s) can be found in the Related Items tab. This practical guide provides you with rock-solid, readable guidance. Based on the original work by Judge William C. Hillman, a recognized U.C.C. 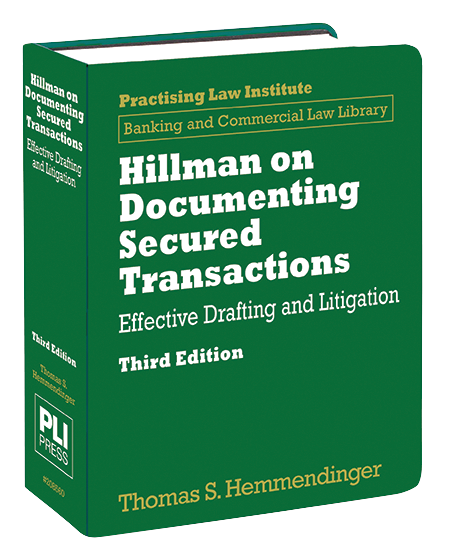 authority, this new edition of Hillman on Documenting Secured Transactions presents Article 9 best practices from a twenty-first-century perspective, giving you a working grasp of the legal, technical, and business aspects of Article 9 transactions. Thomas S. Hemmendinger is of counsel to Brennan, Recupero, Cascione, Scungio & McAllister, LLP, of Providence, Rhode Island, and Taunton, Massachusetts. He counsels financial institutions, logistics companies, and other businesses on commercial loan documentation, Uniform Commercial Code matters, commercial transactions, workouts, and commercial and bankruptcy litigation. He also serves as a court-appointed receiver. He regularly writes and teaches on these and other topics for lending institutions and for continuing legal education organizations. He is a member of the Uniform Law Commission (National Conference of Commissioners on Uniform State Laws). He is also a member of the American Bankruptcy Institute, the American Bar Association’s Business Law and Real Property, Probate and Trust Law Sections, and the Association of Commercial Finance Attorneys. Mr. Hemmendinger received his A.B. from Brown University and his J.D. from the University of North Carolina School of Law.